Jim signed for Celtic in 1962 from junior side St Roch’s although it was not until the 1968-69 season that he could regard himself as a first team player. His first appearance was against Falkirk in September 1963 when he played right half at Brockville alongside his brother and winger Frank Brogan, being one of a select few Celtic players who appeared for the Celts alongside a sibling. He showed great loyalty to Celtic by performing in the reserves for a long period and it was only when John Clark was injured in February of 1968 that Jim was given an extended run in the side and never looked back. Brogan had a great end to the season as Celtic went on a long unbeaten run and won the league at Dunfermline in their last game on April 30th 1968 to give Jim his first winners medal. He was a natural in an aggressive role at sweeper alongside centre-half Billy McNeill. Jim was noted for his no nonsense attitude and strong tackling. In the Scottish Cup final against Rangers on April 26th 1969 he helped Celtic to fantastic 4-0 victory and stood his ground in a physical encounter notable for many heavy challenges. This was right up Jim’s street and he was well capable of handling himself when the going got tough. The 1969-70 season was perhaps Jim’s best for Celtic, when the club reached its second European Cup Final. He had excellent games against Fiorentina and especially against Leeds when he and McNeill helped to blunt the famed Leeds strike force of Mick Jones and Alan Clarke. 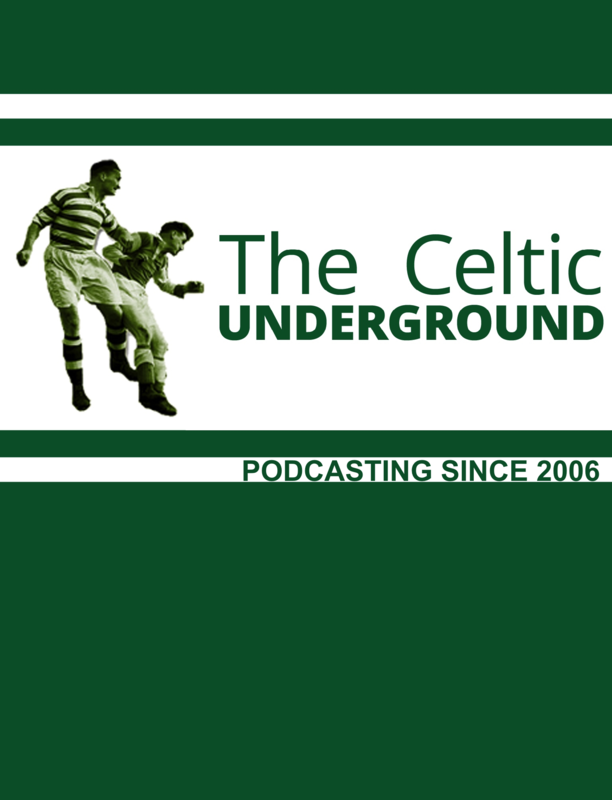 Sadly, Celtic went down 2-1 to Feyenoord in the final in Milan, and it’s worth noting that Jim picked up an early injury which severely weakened the team on the night. Jim continued to be a regular in Stein’s great Celtic sides of the early 1970’s and was converted to left-back in 1971 after Tommy Gemmell fell from grace and was moved on. 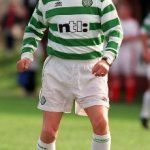 Two of his earliest outings in the number 3 shorts were in the 1971 Scottish Cup final and replay against Rangers when Celtic eventually won 2-1. Jim was up against Willie Henderson on both occasions and twice managed to win his personal battles with Rangers right-wing star. In 1971 he won four caps for Scotland, such was his good form, and he had the distinction of playing against England at Wembley in a 3-1 defeat on May 22nd 1971. 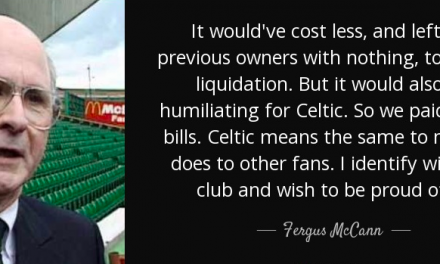 Jim became one of Jock Stein’s most experienced and trusted men. 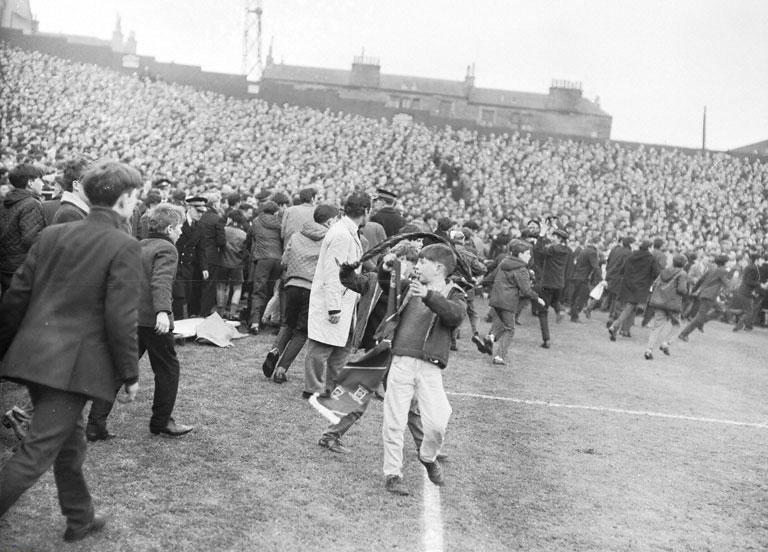 This experience was put to good use in the spring of 1973 when Rangers pushed Celtic all the way and the 8th consecutive title was only clinched on the last day at Easter Road with a 3-0 win against Hibs in front of 45,000 fans. 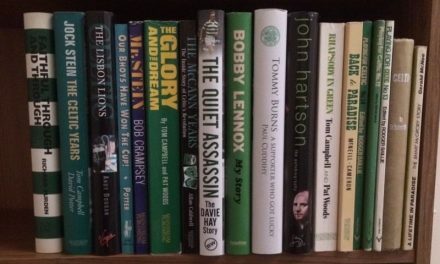 By the autumn of 1973 only McNeill, Johnstone, Lennox and ‘Brogie’ remained at Parkhead from the old guard of the sixties as Jock Stein went through a successful rejuvenation of the side with the younger element such as McGrain, Connelly, Hay and Dalglish now permanent fixtures in the first team. 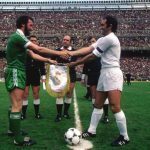 Another League and Cup double came Celtic’s way in the 1973/74 season although the season was spoiled when the thugs of Atletico Madrid came to Glasgow and soiled the name of Spanish football with their rough house tactics. On a happier note Jim was in the team that won the ‘9 in a row’ League championship at Brockville on April 27th 1974 and was in the Celts side that beat Dundee United 3-0 in the 1974 Scottish Cup Final. Season 1974-75 was to be Jim’s last with mixed results. He was in his normal left-back position when Celtic blitzed Hibs 6-3 in October 1974 in the League Cup final, although Celtic lost both the Glasgow derbies in the league, results that would ultimately cost them 10 in a row. On September 14th 1974 he was controversially sent off against Rangers at Parkhead with the score at 1-1 and this contributed greatly to Rangers winning the game 2-1. By the spring of 1975 he had lost his left back position to Andy Lynch and it was Lynch who got the nod for the Scottish Cup final against Airdrie on May 3rd 1975. By this time it was announced that Jim was being released and Jock Stein made him captain in an emotional last appearance against Rangers in the 1975 Glasgow Cup Final on May 10th. 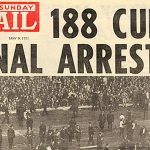 This game was played in part to celebrate Glasgow’s 700th anniversary and finished in a 2-2 draw in front of a crowd of 70,000. 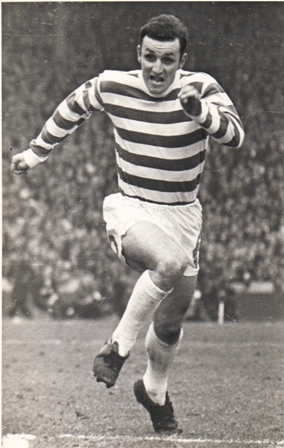 Jim Brogan was not noted for goalscoring but he will always be remembered best for one particular goal. Against Rangers on January 3rd 1972, with the game at 1-1 and in the 90th minute, Harry Hood superbly controlled a ball and lobbed it across goal, where Jim stole in to glance the ball past Peter McCloy to give Celtic a highly dramatic victory. Jim Brogan won 7 league titles, 4 Scottish Cups and 3 League Cups and will always be remembered as one of Celtic’s most successful players. With his whole hearted attitude, determination and great defensive play Jim was an inspiration in Jock Stein’s successful sides from 1968-1975. it’s worth pointing out that in this modern day, Jim’s 12 year’s service would entitle him to a lucrative testimonial game. For those fans who watched Jim Brogan, they will recall with fondness his courage and determination which was on show every game he played. ‘The Brogie Man’, as he was often referred as, was one of the great Celts of a very successful era. May Jim Brogan rest in peace and the thoughts and prayers of all Celtic supporters are with his family at this time.